CROSBY  TXDoT is making plans for a new exit from U.S. 90 westbound onto the westbound feeder road that runs onto FM 2100. When the Star-Courier first carried the story of Texas Department of Transportation (TXDoT) intending to build a new exit ramp into Crosby from U.S. 90 from the westbound side the intended location at that time was to be where Friendly Ford of Crosbys western-most entrance is now located. Since that time, many local folks have pointed out what appears to be the construction of a ramp onto F.M. 2100 on that westbound side. Well, according to correspondence with TXDoT, they are not yet out of the planning phase for that exit. This project adds a new exit ramp just west of Krenek Rd. It will connect from the existing US 90 westbound main lanes to the existing westbound frontage road. This project also moves the existing entrance ramp, currently just west of Krenek Road further west, to the east of FM 2100. This new entrance ramp will connect from the existing westbound frontage road to the existing westbound main lanes. Nothing in this project connects directly to FM 2100. This project is to be let in June. It takes about sixty days for contractors to mobilize. Sixty days after the June 2012 letting should make a start date in early August 2012. Six months of barricades can be expected, the finish date would end up early February 2013. according to Danny Perez of TXDoT. So, whatever is being built there is not the exit ramp, contracts have not been let and the designs are still underway. Current designs place the exit from U.S. 90 before the entrance and the entrance now will be moved further in the direction of Houston. Another implication is that a great deal more traffic is being foreseen for the Crosby area about the time that the construction of the railroad overpass of FM 2100 is completed, expected in Summer of 2013. Notice that most county and state agencies undertaking projects estimate conclusion of better roads in 2013. Voters are finishing up Early Voting this Thursday and Friday, May 24 and 25, and if they didnt vote early, they will have a chance on Election Day, Tuesday, May 29 from 7 a.m. to 7 p.m. Early voting could be at any location in Harris County, but on Election Day you will have to vote only at your precinct. Democrat and Republican ballots have their candidates, and a variety of propositions that are none binding. Of interest on the Democratic ballot will be the race for president, with incumbent Barack Obama facing three challengers, and for U.S. Senate there are 4 office seekers. Sheriff Adrian Garcia has two opponents. For County Commissioner in Precinct 4, Sean Hammerle and Dave Wilson are on the ballot to face the presumptive incumbent, Jack Cagle. Of special interest in East Harris County is the race for Justice of the Peace, Pct. 3, Place 1. Incumbent Judge Mike Parrott, who has held the office since 1993, and gained praise for his Teen Court and other practices, will face a challenger Latonya Allen for the first time since taking office. Another closely watched race is incumbent Constable in Pct. 3, Ken Jones. He is opposed on the Democratic ballot by Eric Reed and Kenneth Perkins. 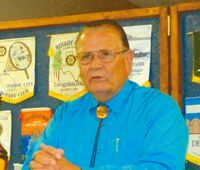 Speaking at a recent Highlands Rotary lunch, Constable Jones reviewed his 11 years in office, and talked about improvements he has brought, including short response times, use of reserves, a new team policing concept being developed with the Sheriffs office, and plans to get new cars and replace deputies that were cut from the budget last year. The Democratic ballot will also have three non-binding referendums, on college tuition, immigrant status, and legalizing cansinos. On the Republican ballot, Mitt Romney heads a long list of presidential hopefuls, and David Dewhurst is the front-runner for Kay Bailey Hutchisons vacated U.S. Senate seat. In State Rep. District 127, incumbent Dan Huberty is challenged by Bobby Jordan. A high profile race is for District Attorney, with incumbent and sometimes controversial Pat Lykos seeing a challenge from Mike Anderson. For sheriff, one from a large field will try to unseat Garcia in the November election. Mike Sullivan, a Houston City Councilman, is running against incumbent Don Sumners for County Tax Assessor-Collector. County Commissioner Pct. 4 is currently the appointed Jack Cagle, and has two opponents in the primary. Two Republican candidates are vying for the opportunity to oppose Constable Jones in the fall election. Both are Sheriffs deputies, with an eye on serving local policing needs, and recently spoke at Highlands Rotary. David Cruzan is a resident of Huffman, and wants to serve the community. He has been a church Youth minister, and served in the marine corps. Cruzan has done police work throughout the world, he said. He has been a Sheriffs deputy for 22 years, as a patrol deputy and as an accident investigator. He is also an instructor at the Sheriffs Academy. Cruzan is active in an organization K-9 for Cops. He is one of 2 sergeants working with dogs, and the department has acquired 10 new dogs, with 6 more coming. He claims that the burglary rate is increasing in this area, and the policing units need to be more visible, and more pro-active in their work. He says the Constables Office should Serve and Protect, with their #1 priority public safety. He proposes quarterly meetings with the public to keep them involved, informed, and to get their help in policing. Cruzan cites the high DWI offenses as a sign of the need for more patrols. This is especially important on FM2100, which has seen 8 fatalities and 200 accidents from DWI offenses. Other policing concerns are gang activities, game rooms, and meth labs, all of which require cooperation with the Sheriffs office and the courts. Norwood originally had a degree in Theology before entering the Sheriffs service 30 years ago. A resident of Baytown, he is concerned about security for the public, and favors a more proactive approach. He feels that patrols can be increased, and even offers to drive a patrol car himself. He also would establish storefronts in several communities, to bring the Constables office closer to the people. Norwood has been working in the County Jail for many years, and says he brings a compassion and understanding to the job that could be applicable to work as a Constable. He has also worked as a baliff, serving four different judges, learning all aspects of criminal, civil, and family law. One unique view that this position has given him, is that bookings after arrests take too long, and by hiring more clerks, faster bookings would mean more officers would return to street patrol sooner. If elected as constable, Norwood vows to give my heart to the community to make it a safe place to live, work and visit. The Republican ballot also will have five non-binding propositions, regarding free choice of schools for children, repeal of Obamas healthcare laws, permission to have public prayer, limits on public spending and debt, and provision for the State Legislature to redraw federal and state districts instead of the courts. 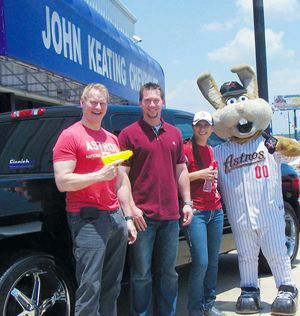 Last Saturday was great fun for baseball and Chevy fans, as Astros mascot Junction Jack, and third baseman Chris Johnson appeared at a family Barbeque at the JohnKeatingChevy dealership in Crosby. Johnson signed baseballs for fans, and kept everyone entertained with inside stories of the team.